The Muscovy breed of ducks is not of a domestic lineage, but they are relatively easy to take care of at home. As pets, they are easy to raise and quick to learn. Their diets are easy to manage as they can source out plants as additional sources of food without additional expense. As to growth and development, raising Muscovies takes a little longer. They start off as eggs which are incubated at 85 to 90 degrees Fahrenheit for as long as 35 days. Ducklings which hatch early in a mother’s nest are also quickly moved and heated in a duckling brooder. Muscovy ducks hate overcrowding when they are brooding and require more space as they grow bigger. Otherwise, they’ll get all irritable and noisy on you. They’re naturally slower to develop, gain weight, and feather compared to other ducks, so don’t be tempted to raise the temperature as it will only slow down the feathering. Temperature has to be gradually lowered until the young adjust to room temperature. Baby Muscovy ducks thrive on a diet of chick crumbs and clean water which progresses on to chick starters and growers in finely-ground or pellet form at around three weeks. Their water troughs just have to be supplied with fresh water. Within the first three to six weeks of raising Muscovies, they can be transferred to a bigger cage and given access to an indoor wading pool which they will thoroughly enjoy. Beyond six weeks, Muscovies are allowed to go outdoors but are cooped up at night to protect against predators. In full grandeur, a duck of the Muscovy breed becomes a duck that flies at eight weeks of age, and at three months it is able to fly well and swim safely alone or in groups. In the wilds, Muscovies go through the same mating ritual as other domestic ducks do in the fall. 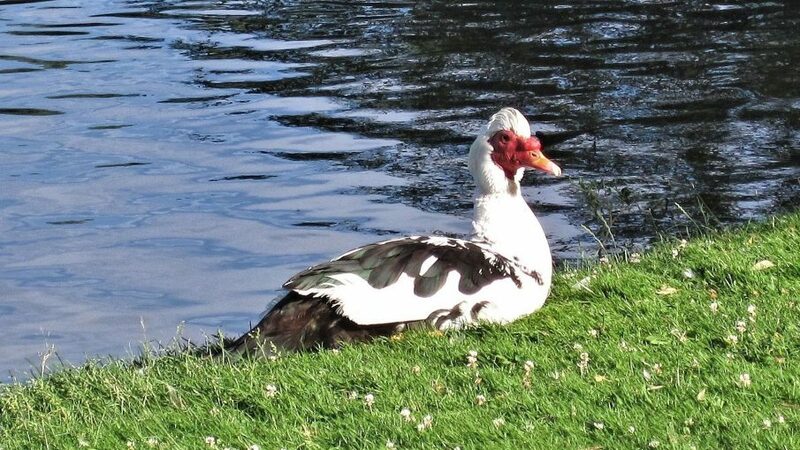 Muscovy drakes display their feathers and whistle or grunt at the females, while the females respond in kind with loud quacks and hoots of approval. This courtship play usually happens in water with a lot of splashing and activity. It ends up in formation of pairs and mating behavior until the time comes to migrate to the North in winter. Like all drakes, Muscovy males are noncommittal in their relationship and soon depart after the eggs have been laid on the nest. It’s left to the mother duck to brood over the brooding which it is quite adept at anyway. For mom’s sake, it’s good that these young can immediately fend for themselves right after they’re born. They quickly learn to feed, scratch, and swim while staying close to their mother’s side. Well, so much for single parenting the duck way. Adult ducks are social beings who enjoy the company of other ducks even in captivity. At night, a drake is lucky enough to be cooped up with five or six females at a time to maximize the laying of eggs. At daytime they’re let loose to mingle in the yard. Muscovy ducks are a hardy duck breed not susceptible to common fowl diseases. They’re part of any home or farm scenery, as long as there’s a water hole lurking somewhere. They’re such likeable creatures, and all the fuss and noise Muscovy ducks sometimes create can be rather endearing.